Blankenmarch is a village northeast of Leyawiin. It is in the Blackwood region, along the route of the Yellow Road, about halfway between Leyawiin and Nocturnal's Shrine. It consists of three houses belonging to each of the people and a small farm plot. An Imperial Legion Forester patrols the wilderness around the settlement. The interiors of the homes in Blankenmarch are very unkempt; tables, chairs, and other furniture lie in disarray, and food and other items are scattered on the floors. Skooma can be found in a wooden chest in Floyd Nathan's House. All of the village's inhabitants are male. The Ayleid ruin Veyond is close by to the south-southeast and is inhabited by unique Azhklan Trolls, which hints at an Unfinished Quest. 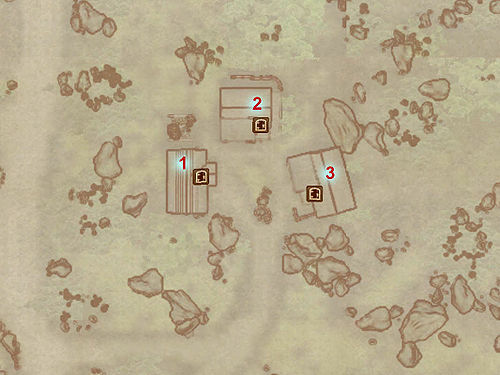 19 Tiger Lily plants are in three locations inside the village itself, and the Reman Rune Stone nearby to the south-southwest has 20 uncommon and useful Bog Beacon Asco Cap plants. 1 Arrowroot In the only farm plot (beside Hanz gro-Hubrag's house). 2 Bergamot Seeds Just outside the farm plot. 1 Blackberry In the farm plot. 4 Bread Loaf 3 in Floyd Nathans' house, in a basket; 1 in Philip's house, on a table. 1 Carrot In the farm plot. 11 Corn 8 in the farm plot; 3 in Floyd's house, on a table; 2 in Philip's house, on a table. 4 Flour In Floyd's house, on the floor. 5 Ironwood Nut In Philip Franc's house. 2 Garlic In Floyd's house, on a table. 3 Ginkgo Leaf In Hanz's house, on the floor. 3 Grapes 1 in Floyd's house, on a table in a bowl; 3 in Philip's house, on the floor. 3 Leek In the farm plot. 1 Lettuce In Philip's house, on a shelf. 1 Monkshood Root Pulp Just outside the farm plot. 1 Mutton In Hanz's house, on the floor. 3 Onion In Hanz's house, on the floor. 1 Pear In Floyd's house, on a table. 1 Potato In the farm plot. 1 Radish In the farm plot. 2 St. Jahn's Wort Nectar Outside Philip's house. 1 Shepherd's Pie In Philip's house. 2 Strawberry In the farm plot. 19 Tiger Lily Nectar 7 outside Hanz's house, 4 outside Floyd's house, and 8 outside Philip's house. 1 Tobacco In the farm plot. 11 Tomato 2 in the farm plot; 9 in Philip's house, 8 in a basket and 1 on a table. 2 Wheat Grain In the farm plot. Esta página foi modificada pela última vez à(s) 10h47min de 19 de outubro de 2014.